Indiana University School of Informatics and Computing at IUPUI faculty members Andrea Copeland, Albert William, Zebulun Wood, and Ayoung Yoon received a New Frontiers of Creativity and Scholarship Award in the amount of $57,043 from the IU Office of the Vice President for Research for their unique collaboration in archival preservation and 3-D virtual environments. Their project, “Virtual Bethel: Underrepresented History and Primary Source Education through Virtual Reality,” is “a wonderful demonstration of the interplay between informatics and digital archiving,” said Executive Associate Dean Mathew J. Palakal, School of Informatics and Computing at IUPUI . Within weeks of a plan to close the doors on the Indianapolis Bethel AME (African Methodist Episcopal) Church, faculty and an alumnus from the Indiana University School of Informatics and Computing at IUPUI worked to save the historic church’s troves of archival documents and objects. Out of this significant contribution to the city’s storied past comes something for the future—a virtual 3-D walk-through of the church that will be open for public use—re-created by faculty and students from the School of Informatics and Computing. 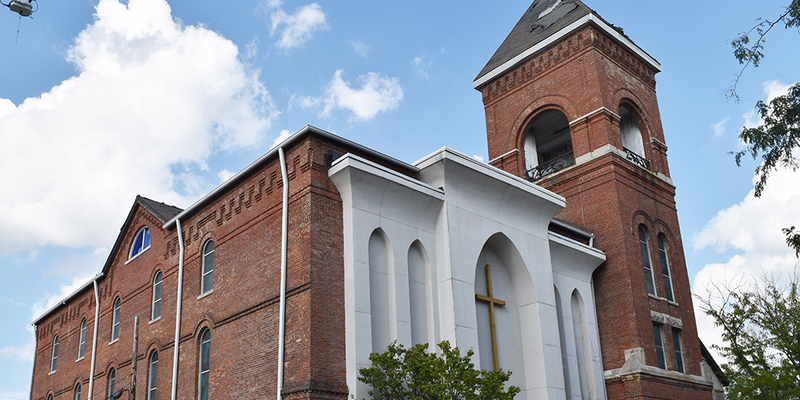 Founded in 1836, the Bethel AME Church played vital roles in the Underground Railroad, the founding of Indiana’s NAACP, and the School for Black Children in Indianapolis. Parishioner Frances Connecticut Stout started the collection of U.S. records for the church in 1940. Those records were later cared for by Olivia McGee-Lockhart, a lifelong member of the church. Baptismal records, tithing records, $1.35 in change from a collection—these preserved items are among the many objects that will tell a rich and vibrant story that includes Madam C.J. Walker and many other prominent Black residents of Indianapolis who attended Bethel AME. All this was in danger of being lost—possibly forever—until IU School of Informatics and Computing alumnus Rodney Freeman, a library administrator and founder of Project Back-Up, initiated a plan to save the records. Andrea Copeland, a faculty member in the Library and Information Science (LIS) program at the IU School of Informatics and Computing at IUPUI, provided additional assistance, along with LIS alumna Kisha Tandy and Wilma Moore of the Indiana Historical Society (IHS). For the past three years, containers of records, memoirs, and memorabilia have been painstakingly recorded and organized into 200 archival boxes by Tandy and Moore at the IHS. Copeland, who has researched and written on the topic of participatory heritage, recognized the importance of preserving the church’s history for future generations. “The Internet has democratized our ‘story’. We don’t need to have credentials to understand its value. At the same time, we don’t want archives and libraries to become irrelevant—we need to have open access. We hope to build a system that connects community to resources as a model of shared expertise and respect,” Copeland said. School of Informatics and Computing faculty members Zebulun Wood and Albert William of the Media Arts and Science program have years of experience creating 3-D models in virtual environments. Wood reached out to his colleagues at Online Resources in Lebanon, Indiana, to 3-D scan the chapel within weeks of the church’s public access deadline. Students from the 3D Production class, offered in the fall semester at the School of Informatics and Computing at IUPUI, photographed every square inch of the church—3,000 images were created for referencing during the 3-D modeling process. When complete, the 3-D model will be publicly accessible from the School of Informatics and Computing and the digital images used to create it will be housed at the IUPUI Library. The digitized archive will reside at the IHS along with the original archival records. Ayoung Yoon, assistant professor in the LIS program, was consulted on the project because of her research interest in the emerging field of digital preservation and data curation. Yoon’s work focuses on the long-term impact of environment and technology integration on the archival process and digital preservation. “There is not just one solution. We have a lot to learn,” Yoon said. Wood, William, and their students will go on to create a detailed virtual learning space, complete with blue stained glass windows, an authentic re-creation of the pulpit and chair from the church, and various documents. A bare-bones, first version of the space has already been designed. It was well-received by the members of the church and IHS team, who were invited for a virtual walk-through. Digital virtual experiences of archival materials lower barriers to access and are friendlier for users. The technology provides new inroads for all to understand the history that surrounds them. Together, Yoon, Wood, Copeland, and William will work to make sure the digitized images are available in perpetuity. “We can assume in 20 to 30 years the assets we’re using now will be gone. We won’t know what devices we will be using—inputs and outputs are ever-changing,” Wood said.